Requirement Details: AS PER CUS.REQ. Information architecture is a specialized skill set that involves interpretation and categorization of information into a coherent structure, preferably one that the intended audience can understand quickly, and then easily retrieve the information for which they are searching. The information architecture provides the design team with the necessary prototype, which is then perfected with the help of the visual designers, content creators as well as developers. Manuals, Instruction Books, Price Lists, Menus, Guarantee Cards, Application Forms, Processing Documents, Educational and Training Material. Know what you want on your site, but unsure of how it'll be organized Not a problem. 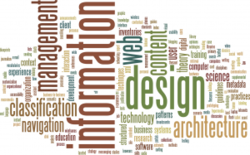 Our information architects will assist in organization and help position your site to be accessible and usable. We figure out the best way to group the content in your product, what to label those groups, and how to set up the hierarchy of information.